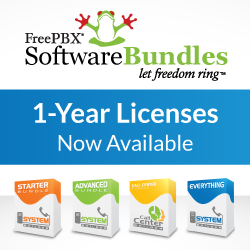 Hi all, Philippe here, I’m super excited to have the privilege of announcing the official release of FreePBX 12 Beta available for immediate consumption. Version 12 has been in alpha for over 6 months with several months of planning before that and to those thousands of you who have downloaded and helped test we thank you for helping make this a reality and hope you like the really cool stuff the team has done! The FreePBX community has grown tremendously in the past year and along with it, the number of resources we’ve dedicated to its continued success has grown with it! The goals of version 12 have been multi-faceted, starting with the community! In order to better engage the community we’ve spent the last year upgrading everything from an improved wiki and bug tracker, a translation server, a transition from SVN to Git, to a brand new best in class forum based off of Discourse to provide tools for you to help us and each other make the best product possible! With the significant changes in Asterisk 12, we also set out to have FreePBX 12 support this new version of Asterisk, some of which we talked about in an earlier blog, PJSIP and the Long Awaited FreePBX Asterisk Recording Interface Replacement. Support for Asterisk 12 was just the beginning, we’ll talk about the really cool stuff in a moment! On the development side, I’m honored to introduce you to the real drivers of this release as I think the work they have done is astounding and something that we are proud to bring to this great community! I hardly think these guys need an introduction if you’ve spent any time in our forums, but I’d like to ask you to join me in giving special thanks to the tremendous job that Andrew (tm1000), Bryan (GameGamer43), Rob (xrobau), Jason (Qwell) and Luke (DatorHerren) have done in bringing you a version that warrants a jump from 2.11 all the way to FreePBX 12 in one leap! Since Andrew has taken the initiative and lead on so many aspects of these changes we are bringing you, I will let him tell you next about FreePBX 12 and some of the great new capabilities that the team has pulled out of their hat! I appreciate the introduction that Philippe provided and I want to to tell you about everything we’ve been up to. I want to jump right to the meat of what we’ve been up to by highlighting some work that we are really excited to bring to you today! I’ll touch on the other things at the end! If you were lucky enough to be at last year’s FreePBX World or Astricon, we told you we were finally getting to the rewrite of the User Control Panel (UCP), also known as the ARI (as in Asterisk Recording Interface). There’s really so many cool new things about the new User Control Panel that I will only step through a few of them but first off let me say that it is fully HTML5 and Mobile compliant. Though stipulation on both of those items this is still beta so many things may still be broken and because of licensing issues with the mp3 and mp4 codecs UCP does not (at this moment) have support for either of those, so listening to messages on your iphone is a no go. But don’t worry, we have a solution in mind for you iPhone users but it will require manual setup on your end. More on that in the next few weeks. Furthermore UCP also supports in browser recording of voicemail greetings, in browser playback of voicemail messages and recordings. Drag and drop of voicemail messages. Desktop notifications of new faxes (with the Fax Pro add-on) or voicemails. And for all of you Fax Pro users out there sending a fax now works in NON blocking mode, meaning the browser won’t freeze while sending your fax, everything will happen in the background. Additionally you can set your presence state on the fly, view participants of conferences and mute them or kick them from a conference (Conference Pro). As an administrator you are now able to define which users you add through User Manager can see which voicemail boxes, conferences or user settings. So now you can create a CEO that has access to his voicemail box and the receptionists voicemail box or multiple users who are able to control conferences. Or who gets to view CDR reports. The initial loading screen will look similar to what is displayed above. Each “section” is modular, meaning other modules will be able to supply the initial dashboard with their own sections/areas – and we’d love people to dive and and write some modules that they’d like to see! Furthermore each section can be dragged into the order you want them to be set and FreePBX will remember this order until the next time you change it. As you can see in the view below I’ve moved the sections around a bit so that the FreePBX blog (which can contains important security notices) is the first thing I see. Furthermore FreePBX’s new dashboard logs data even while you are away from your PBX so you can pinpoint exactly when you are (or were) having problems as far back as a month from now. Lastly, something that is near and dear to my heart is the reintroduction of the textarea input method when setting up Dial Patterns for outbound routes and trunks. The outbound routes and trunks dialpattern rules have always been very confusing to many novice users and experienced users as well. FreePBX 2.8 changed the GUI input method to help clarify the otherwise very cryptic nature of these dial patterns as well as add new capabilities and power to the feature set. Although very well received for a significant portion of users, there are power users who have complex and long rules and the inability to easily cut and paste those rules between screens or the ability to have over 1500 dial patterns has been a hindrance that we wanted to address. I am glad to announce that the textarea has been reintroduced in FreePBX 12 and can be easily enabled with the change of an Advanced Setting. You can permanently leave it in either mode, or switch between them as often as you like. Just look for the “Enable The Old Style FreePBX Dial Patterns Textarea” in advanced settings to switch back and forth as you need. The easiest way to get access to the beta is by downloading the FreePBX Distro at http://schmoozecom.com/distro-download.php and following the steps in http://wiki.freepbx.org/display/HTGS/1.+Install+FreePBX. You can also download the tarball of just FreePBX manually from http://www.freepbx.org/download-freepbx and run through the setup processes documented in http://wiki.freepbx.org/display/HTGS/Version+12.0+Installation. Andrew – On Behalf of the FreePBX Team! Next PostFreePBX World 2014 – Get your FREE PASS today!